How to place a chest tube! To better understand how a chest tube, we must remember the anatomy of the chest. The thorax is divided into three compartments: one for each lung cavity and the mediastinum in the middle. The pleura is a kind of tapestry or membrane of both the chest wall (parietal pleura or chest) and that of each lung (visceral pleura). Between them there is a space (pleural space) and the lung expands to fill its own pleural chamber is airtight. These two membranes are continuous with one another and are in close contact, such as the sides of an empty shell, sealed and flat. The so-called “pleural space” between the two sides of the wrapper is not really a real space. It contains only a thin layer (5 to 15 ml.) Liquid lubricant, which remains in contact the two pleural surfaces, while allowing them to glide smoothly over one another during respiration. In certain situations, however, the area between the pleural membranes can become a real space, and this leads to most problems that require a chest tube. The elastic tissue of the lung and chest wall are pulling in opposite directions, tending to collapse the lung inside the chest wall and throw it out. As these two opposing forces try to separate the parietal and visceral pleura, make the pleural space pressure decreases and becomes negative. Negative intrapleural pressure in contact the two surfaces and keeps the lungs from the chest wall and diaphragm. Christian, there is a difference in pressure between the outside (zero, slight negative and positive) and both pleura (always negative pressure), which make the lung can expand properly with each breath. It’s a bit more negative on inspiration (-8 cm. Of water) and a little less negative during expiration (-4 cm. Of water). Otherwise, the lung would tend to collapse. Normally the pleural space has no air and almost no liquid. But if it gets blood or air (or anything else for example, pus, tumor material, etc), separates the pleural surfaces and counteracts the negative pressure that holds them together. The easiest way to separate the pleural space is to open a hole and goes into the air. This hole can cause such accident (thorax trauma of a broken rib). The pressure difference (lost negative pressure) causes the lung to collapse and the patient has severe respiratory failure. You can also occur for the violent actions of a weapon (a knife) or a firearm (the bullet of a gun) and opening the chest wall collapses the lung and in both cases as in accidental trauma , bleeding may occur that complicates life. The accumulation of air or fluid also occupies space in the pleural cavity. The result? The lung is totally or partially collapse, respiratory effort increases and the supply of residual lung air supply is reduced. The patient is at risk of dying. Iatrogenic pneumothorax: an accident occurred during the execution of a technique in the thorax (eg central venous catheter placement in the subclavian vein or jugular vein). Spontaneous tension pneumothorax: a small area in the lung that is filled with air, called a pulmonary bleb breaks and air leaks into the space around the lung. Activities such as scuba diving, smoking marijuana, high altitude hiking and fly, can lead to lung collapse especially in tall, thin people with asthma. This is where stage the chest tube. As air or fluid that is released through this tube, intrapleural pressure is restored negative and re-inflates the lung to re-fill the cavity. Chest tube connection to a Pleur-evac ®. 1 .- What is the thoracentesis? Thoracentesis, also known as pleural puncture is a test performed in order to remove fluid from the pleural cavity both for diagnostic (Diagnostic thoracentesis) and therapeutic. The puncture is made through the chest wall to reach the pleural cavity, so it is considered a transthoracic puncture. Both procedures can be performed at the same time. It makes cutting the skin, is dissected by planes. You mean, we separate the subcutaneous fat and the layers are opened up to the area where we decided to enter, usually in the mid-axillary line, between the 4 th to 6 th rib. Separating opens an eye with a finger and inserted it into the pleura. A click or air outlet will notice when opening the parietal pleura (which is lining the rib cage). If we perform the insertion with a simple press on numerous occasions there is no need to get to dissect the pleura (although it is preferable to do this). Leading the chest tube between the costal arches, is done by hand pressure that pushes the tube, while the one in the chest wall running the same, makes a counter maneuver to avoid an unwanted fast forward and tube into the chest cavity and can damage it. The maneuver is simple, but always calculating pressure and counterpressure with our hands. Watch the video below. 4 .- Connection to a chest tube Pleur-evac ®. It is simply connecting the end of a chest tube connected to the aspiration for Pleur-evac ®. There are different systems on the market such as vacuum systems for negative pressures and prevent the collapse of the lung. 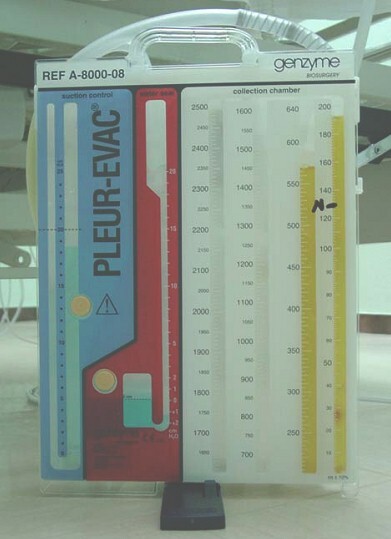 The Pleur-evac ® is the most widely known and used. It consists of a system of three interconnected chambers with a single connection to the patient. In the first chamber collects the drainage of the pleural cavity obtained, which should be easily visible and quantifiable. The second chamber is an underwater seal, connecting the pleural space on the underwater camera, so that lets out the air from the pleural space and has a valve that prevents the entry of liquid or air into the pleural space. The third camera is graded, connected to the above and can connect to a central vacuum system, can scale the negative pressure on the pleural space by the amount of saline to be filled, the negative pressure on the pleural space is given by the hydrostatic pressure resulting from the difference between the height of water in the third chamber about the height of water in the water seal. The advantages of these systems lies in the ease of use, which can quantify the daily drainage and lets you control the negative pressure on the pleural cavity, thus avoiding the pressure variations of wall vacuum systems. If no suction is applied to the third camera, the system functions as a collection chamber and underwater seal. Obviously there are more systems to evacuate pleural air or liquids, however the matter is that it can exert a negative pressure to at least -20 cmH20 for manetener not collapsed lung. After leaving the air, allowing the sealing of the system prior to chest tube removal. Wound closure of incision with a braided black silk needle 00 with two straight edges to close it and proceed with the placing of the chest tube to prevent movement. We note that the patient already has another chest tube placed underneath. This occurs in patients with pleural fistula high flow (in which a single tube is unable to drain all the air) or in patients with pulmonary hemorrhage, empyema (pus or inflammatory) where a single tube can not re- expansiñón the lung. Sometimes takes up a third or fourth tube including at midline anterior chest infraclavicular. Reexpansion failure: We happen if incomplete reexpansion despite good positioning and suction tube. In this case it is required to assess thoracotomy decortication. Usually there is a high debit pleural fistula.
. Persistent air leak ·: Generally, if this situation lasts more than a week, surgery should value, if it is accompanied by incomplete re-expansion must be evaluated a second drain. · Placement wrong: The most common is a drain hole to let out of the pleural cavity in small diameter tubes, causing subcutaneous emphysema. More unusual is placed in the soft tissues of the chest cavity. In either of these two situations would have to reposition the tube. · Emphysema occurs when air gets into tissues under the skin. It usually occurs on the skin covering the chest wall or neck but can also occur in other parts of the body. Subcutaneous emphysema can often be seen as a smooth bulging of the skin. When the doctor feels (palpate) the skin, it produces an unusual crackling sensation as the gas is pushed through the tissue. · Intrapleural hemorrhage, most often occurs in the elderly and is given by placing the tube just under the rib to injure an intercostal vessel. If the bleeding is heavy and red, is that an artery is injured and if it is slower and dark injured intercostal vein. If it is secondary to an inflammatory or tumor is checked from the moment it drains. · Empyema: Is the output of inflammatory material in the pleural space, usually infected (severe pneumonia). Also in pneumothorax occurs secondary to trauma or in cases of drains maintained for long periods. · Intercostal neuralgia: pain, swelling, previously irradiated, and sometimes chronic, long after drain removal. Antineuralgic painkillers and are used as inflammatory-type conditions. Provide patient care necessary to ensure proper evacuation of the pleural fluid (air and / or liquid) making lung re-expansion and improvement of breathing pattern, and prevent complications such as infections. Sterile gloves or at least contact. 18 gauge sterile needle or 20. Syringe of 5 or 10 ml. « Cómo se pone un drenaje en el Tórax! It could be that Idol demands united states of america to meet two or three inaccurate people young and old in the past gathering the most appropriate one, make sure weight training in conclusion fulfill the particular, i will are able to become happier. Go to this review webpage..